This recipe is very common in Antakya region, Turkey. As my hubby is from somewhere around there, this dish is definitely one of his favourite. So when our home is loaded with olives, this is the easiest way to use them up. A delicious and easy way!!! 1. Remove stones from olives. 2. Cut all vegetables in small pieces. 3. Mix tomatoes, onions, olives and thyme. Add salt and pepper, olive oil and lemon juice. You can also add some fresh parsley. Enjoy!!! 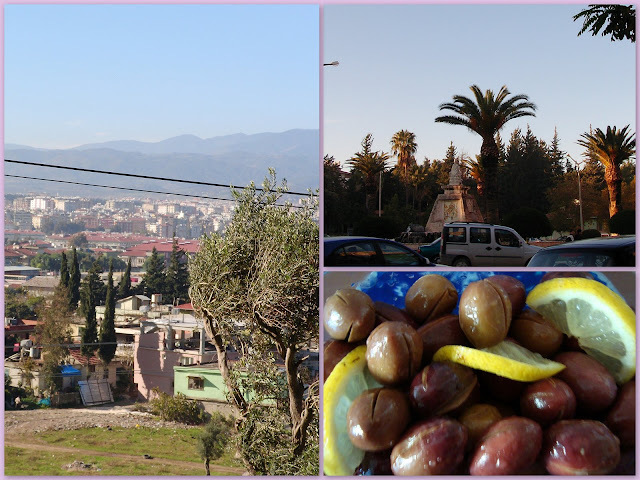 Below I posted a collage of Antakya and olives. Though generally olives found in this region are very small and have bitter flavour. That's why they go so well with tomato freshness.